The School of Trust is based on the respect of three pillars : the core values of the French Republic, the research of excellence and benevolence. 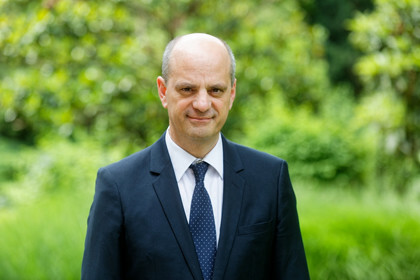 Press file "Together for a School of Trust"
Jean-Michel Blanquer has been the French Minister of National Education and Youth since May 2017. From 2009 to 2012, he served as director of ESSEC business school and previously held several positions of responsibility in the French education system, including rector of the Guyana and Créteil academies, and director general of school education. He has a doctorate in law from Panthéon-Assas University and an M.A. in politics from the Paris Institute of Political Studies (Sciences Po). He has been heavily involved in relations with Latin America, notably as president of the Institute of the Americas and director of the Institute of Latin American Studies at the New Sorbonne University. France will hold the G7 presidency in 2019, hosting a summit dedicated to fighting inequality in Biarritz from 24 to 26 August 2018. France has chosen to prioritise education issues in the G7 discussions. International and French tests show that French students have insufficient mastery of basic skills. Jean-Michel Blanquer gives priority to the mastery of French and mathematics, the basis of all knowledge. Twenty percent of students have not mastered basic skills by the end of primary school. To address this difficulty at the root, it is essential that the most vulnerable students benefit from greater supervision in their formative years and qualitative teaching methods. Several measures intend to improve reading practice, including class size reduction in priority education networks, creation of tools for monitoring students' progress and pedagogical contents about teaching how to read. The excessive complexity of the baccalauréat doesn't guarantee success in higher education. Therefore, Jean-Michel Blanquer is restructuring the general and technological baccalauréat to make it a springboard to success. Transforming vocational upper-secondary schools is essential for giving young people an easier access to the job market. Welcoming students with disabilities in schools responds to a requirement for justice and solidarity. Mastery of basic knowledge by all primary-school students is a top priority. In September 2018, all children enrolled in first, second and sixth grades received assessments. These tests provide teachers with effective benchmarks for identifying students' difficulties early in the year. This edition brings together the key statistical indicators to analyse the French education system and assess the policies implemented. Structured around the resources allocated to the School, enrolment conditions and student outcomes, it focuses on describing the main current trends and sheds light on international comparisons. Although International data are often referred to in the public debate, they are often no less tricky to interpret. Education in Europe: Key figures presents a wide variety of indicators through 30 factsheets including texts, focus, graphs, tables and maps. It thus provides the chance to compare and contrast the multiple dimensions in play for success in education, and this for all European Union member-states that are facing the same challenges, ranging from education for all to learning how to live together in diversity.